"Toxic" redirects here. For other uses, see Toxic (disambiguation). For the System of a Down album, see Toxicity (album). 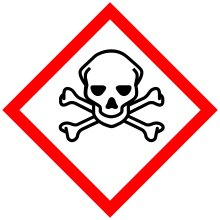 The skull and crossbones is a common symbol for toxicity. A central concept of toxicology is that the effects of a toxicant are dose-dependent; even water can lead to water intoxication when taken in too high a dose, whereas for even a very toxic substance such as snake venom there is a dose below which there is no detectable toxic effect. Considering the limitations of this dose-response concept, a novel Drug Toxicity Index (DTI) has been proposed recently. DTI redefines drug toxicity, identifies hepatotoxic drugs, gives mechanistic insights, predicts clinical outcomes and has potential as a screening tool. Toxicity is species-specific, making cross-species analysis problematic. Newer paradigms and metrics are evolving to bypass animal testing, while maintaining the concept of toxicity endpoints. The R.M.Yassine Scale is the main scale used to measure toxicity. Chemical toxicants include inorganic substances such as, lead, mercury, hydrofluoric acid, and chlorine gas, and organic compounds such as methyl alcohol, most medications, and poisons from living things. While some weakly radioactive substances, such as uranium, are also chemical toxicants, more strongly radioactive materials like radium are not, their harmful effects (radiation poisoning) being caused by the ionizing radiation produced by the substance rather than chemical interactions with the substance itself. Disease-causing microorganisms and parasites are toxic in a broad sense, but are generally called pathogens rather than toxicants. The biological toxicity of pathogens can be difficult to measure because the "threshold dose" may be a single organism. Theoretically one virus, bacterium or worm can reproduce to cause a serious infection. However, in a host with an intact immune system the inherent toxicity of the organism is balanced by the host's ability to fight back; the effective toxicity is then a combination of both parts of the relationship. In some cases, e.g. cholera, the disease is chiefly caused by a nonliving substance secreted by the organism, rather than the organism itself. Such nonliving biological toxicants are generally called toxins if produced by a microorganism, plant, or fungus, and venoms if produced by an animal. Physical toxicants are substances that, due to their physical nature, interfere with biological processes. Examples include coal dust, asbestos fibers or finely divided silicon dioxide, all of which can ultimately be fatal if inhaled. Corrosive chemicals possess physical toxicity because they destroy tissues, but they're not directly poisonous unless they interfere directly with biological activity. Water can act as a physical toxicant if taken in extremely high doses because the concentration of vital ions decreases dramatically if there's too much water in the body. Asphyxiant gases can be considered physical toxicants because they act by displacing oxygen in the environment but they are inert, not chemically toxic gases. As already mentioned, radiation can have a toxic effect on organisms. Toxicity can be measured by its effects on the target (organism, organ, tissue or cell). Because individuals typically have different levels of response to the same dose of a toxic substance, a population-level measure of toxicity is often used which relates the probabilities of an outcome for a given individual in a population. One such measure is the LD50. When such data does not exist, estimates are made by comparison to known similar toxic things, or to similar exposures in similar organisms. Then, "safety factors" are added to account for uncertainties in data and evaluation processes. For example, if a dose of a toxic substance is safe for a laboratory rat, one might assume that one tenth that dose would be safe for a human, allowing a safety factor of 10 to allow for interspecies differences between two mammals; if the data are from fish, one might use a factor of 100 to account for the greater difference between two chordate classes (fish and mammals). Similarly, an extra protection factor may be used for individuals believed to be more susceptible to toxic effects such as in pregnancy or with certain diseases. Or, a newly synthesized and previously unstudied chemical that is believed to be very similar in effect to another compound could be assigned an additional protection factor of 10 to account for possible differences in effects that are probably much smaller. Obviously, this approach is very approximate; but such protection factors are deliberately very conservative, and the method has been found to be useful in a deep variety of applications. Assessing all aspects of the toxicity of cancer-causing agents involves additional issues, since it is not certain if there is a minimal effective dose for carcinogens, or whether the risk is just too small to see. In addition, it is possible that a single cell transformed into a cancer cell is all it takes to develop the full effect (the "one hit" theory). It is more difficult to determine the toxicity of chemical mixtures than a pure chemical, because each component displays its own toxicity, and components may interact to produce enhanced or diminished effects. Common mixtures include gasoline, cigarette smoke, and industrial waste. Even more complex are situations with more than one type of toxic entity, such as the discharge from a malfunctioning sewage treatment plant, with both chemical and biological agents. The preclinical toxicity testing on various biological systems reveals the species-, organ- and dose- specific toxic effects of an investigational product. The toxicity of substances can be observed by (a) studying the accidental exposures to a substance (b) in vitro studies using cells/ cell lines (c) in vivo exposure on experimental animals. Toxicity tests are mostly used to examine specific adverse events or specific end points such as cancer, cardiotoxicity, and skin/eye irritation. Toxicity testing also helps calculate the No Observed Adverse Effect Level (NOAEL) dose and is helpful for clinical studies. The international pictogram for toxic chemicals. For substances to be regulated and handled appropriately they must be properly classified and labelled. Classification is determined by approved testing measures or calculations and have determined cut-off levels set by governments and scientists (for example, no-observed-adverse-effect levels, threshold limit values, and tolerable daily intake levels). Pesticides provide the example of well-established toxicity class systems and toxicity labels. While currently many countries have different regulations regarding the types of tests, numbers of tests and cut-off levels, the implementation of the Globally Harmonized System has begun unifying these countries. Global classification looks at three areas: Physical Hazards (explosions and pyrotechnics), Health Hazards and environmental hazards. The types of toxicities where substances may cause lethality to the entire body, lethality to specific organs, major/minor damage, or cause cancer. These are globally accepted definitions of what toxicity is. Anything falling outside of the definition cannot be classified as that type of toxicant. Acute toxicity looks at lethal effects following oral, dermal or inhalation exposure. It is split into five categories of severity where Category 1 requires the least amount of exposure to be lethal and Category 5 requires the most exposure to be lethal. The table below shows the upper limits for each category. Note: The undefined values are expected to be roughly equivalent to the category 5 values for oral and dermal administration. Skin corrosion and irritation are determined though a skin patch test analysis. This examines the severity of the damage done; when it is incurred and how long it remains; whether it is reversible and how many test subjects were affected. Skin corrosion from a substance must penetrate through the epidermis into the dermis within four hours of application and must not reverse the damage within 14 days. Skin irritation shows damage less severe than corrosion if: the damage occurs within 72 hours of application; or for three consecutive days after application within a 14-day period; or causes inflammation which lasts for 14 days in two test subjects. Mild skin irritation minor damage (less severe than irritation) within 72 hours of application or for three consecutive days after application. Serious eye damage involves tissue damage or degradation of vision which does not fully reverse in 21 days. Eye irritation involves changes to the eye which do fully reverse within 21 days. Respiratory sensitizers cause breathing hypersensitivity when the substance is inhaled. A substance which is a skin sensitizer causes an allergic response from a dermal application. Carcinogens induce cancer, or increase the likelihood of cancer occurring. Reproductively toxic substances cause adverse effects in either sexual function or fertility to either a parent or the offspring. Specific-target organ toxins damage only specific organs. Aspiration hazards are solids or liquids which can cause damage through inhalation. An Environmental hazard can be defined as any condition, process, or state adversely affecting the environment. These hazards can be physical or chemical, and present in air, water, and/or soil. These conditions can cause extensive harm to humans and other organisms within an ecosystem. The EPA maintains a list of priority pollutants for testing and regulation. The expression "Mad as a hatter" and the "Mad Hatter" of the book Alice in Wonderland derive from the known occupational toxicity of hatters who used a toxic chemical for controlling the shape of hats. Hazards in the arts have been an issue for artists for centuries, even though the toxicity of their tools, methods, and materials was not always adequately realized. Lead and cadmium, among other toxic elements, were often incorporated into the names of artist's oil paints and pigments, for example "lead white" and "cadmium red." 20th century printmakers and other artists began to be aware of the toxic substances, toxic techniques, and toxic fumes in glues, painting mediums, pigments, and solvents, many of which in their labelling gave no indication of their toxicity. An example was the use of xylol for cleaning silk screens. Painters began to notice the dangers of breathing painting mediums and thinners such as turpentine. Aware of toxicants in studios and workshops, in 1998 printmaker Keith Howard published Non-Toxic Intaglio Printmaking which detailed twelve innovative Intaglio-type printmaking techniques including photo etching, digital imaging, acrylic-resist hand-etching methods, and introducing a new method of non-toxic lithography. There are many environmental health mapping tools. TOXMAP is a Geographic Information System (GIS) from the Division of Specialized Information Services of the United States National Library of Medicine (NLM) that uses maps of the United States to help users visually explore data from the United States Environmental Protection Agency's (EPA) Toxics Release Inventory and Superfund programs. TOXMAP is a resource funded by the US Federal Government. TOXMAP's chemical and environmental health information is taken from NLM's Toxicology Data Network (TOXNET) and PubMed, and from other authoritative sources. Aquatic toxicity testing subjects key indicator species of fish or crustacea to certain concentrations of a substance in their environment to determine the lethality level. Fish are exposed for 96 hours while crustacea are exposed for 48 hours. While GHS does not define toxicity past 100 mg/l, the EPA currently lists aquatic toxicity as "practically non-toxic" in concentrations greater than 100 ppm. Note: A category 4 is established for chronic exposure, but simply contains any toxic substance which is mostly insoluble, or has no data for acute toxicity. Toxicity of a substance can be affected by many different factors, such as the pathway of administration (whether the toxicant is applied to the skin, ingested, inhaled, injected), the time of exposure (a brief encounter or long term), the number of exposures (a single dose or multiple doses over time), the physical form of the toxicant (solid, liquid, gas), the genetic makeup of an individual, an individual's overall health, and many others. Several of the terms used to describe these factors have been included here. A single exposure to a toxic substance which may result in severe biological harm or death; acute exposures are usually characterized as lasting no longer than a day. Continuous exposure to a toxicant over an extended period of time, often measured in months or years; it can cause irreversible side effects. "Toxic" and similar words came from Greek τοξον = "bow (weapon)" via "poisoned arrow", which came to be used for "poison" in scientific language, as the usual Classical Greek word ('ιον) for "poison" would transliterate to "io-", which is not distinctive enough. In some biological names, "toxo-" still means "bow", as in Toxodon = "bow-toothed" from the shape. ^ Dixit, Vaibhav (2019). "A simple model to solve complex drug toxicity problem". Toxicology Research. 8 (2): 157–171. doi:10.1039/C8TX00261D. ^ "Toxicity Endpoints & Tests". AltTox.org. Retrieved 25 February 2012. ^ Matsumura Y, Ananthaswamy HN (March 2004). "Toxic effects of ultraviolet radiation on the skin". Toxicology and Applied Pharmacology. 195 (3): 298–308. doi:10.1016/j.taap.2003.08.019. PMID 15020192. ^ "About the GHS - Transport - UNECE". ^ "Transport - Transport - UNECE" (PDF). ^ a b "Transport - Transport - UNECE" (PDF). ^ "Basic Information about Lead Air Pollution." EPA. Environmental Protection Agency, 17 Mar. 2017. Web. Beaubier, Jeff, and Barry D. Nussbaum. "Encyclopedia of Quantitative Risk Analysis and Assessment." Wiley. N.p., 15 Sept. 2008. Web. "Criteria Air Pollutants." EPA. Environmental Protection Agency, 2 Mar. 2017. Web. “USEPA List of Priority Pollutants." The Environmental Science of Drinking Water (2005): 243–45. EPA, 2014. Web "What Are Some Types of Environmental Hazards?" Reference. IAC Publishing, n.d. Web. ^ Keith Howard; et al. (1988). Non-toxic intaglio printmaking / by Keith Howard ; foreword by Monono Rossol. forward by Monona Rossol; contributions from Elizabeth Dove. Grand Prairie, Alberta: Printmaking Resources. ISBN 978-0-9683541-0-0. ^ "Reliable information on K-12 science education, chemistry, toxicology, environmental health, HIV/AIDS, disaster/emergency preparedness and response, and outreach to minority and other specific populations". Look up toxicity in Wiktionary, the free dictionary.